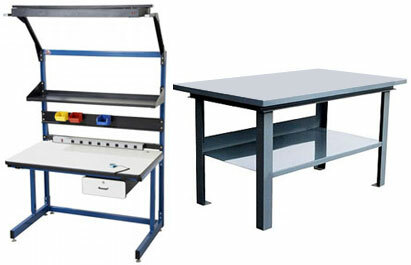 Many varieties include: basic industrial type, heavy duty steel workbenches, shipping workstations, packing stations, over-conveyor workstations, stainless steel, technical & lab workstations, more. Brands: Dehnco, Pro-Line, Penco, Lyon, BostonTec & more. Shop desks from Penco, StrongHold and others for heavy industrial applications. Includes models with integrated drawers, risers, shelves, and more. Ideal for shipping/receiving areas, docks, warehouses. These steel shop tables are fully welded, with capacities up to 10,000 pounds (up to 2,650 per shelf) on shelf models. They are available with shelves, drawers, adjustable legs, back shelves and more. All-welded steel tables with large tops (up to 36” x 72”) have capacities up to 16,000 pounds. Steel tops on most models, with integrated lower shelves and drawers available. See all varieties of work bench, work surface, stands, and industrial desks.